Possibly the best feature of Capital is it’s device agnostic design. That means whether you’re viewing the theme on your desktop, your tablet or your smartphone, it responds and adapts delivering an optimised design for that device. 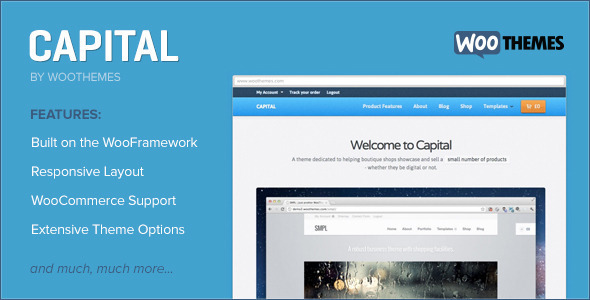 As you’d expect, Capital makes full use of all of WooCommerce features. We’ve painstakingly married theme and plugin to provide a seamless front-end experience. Every single one of WooCommerce widgets has been lovingly styled to match the beautiful design, as has each key component of the plugin such as the product categories, product descriptions, cart, checkout and user account sections. Read all about the benefits of WooCommerce here. There are several colour schemes built into Capital ensuring there is a look to match your brand identity. Choose from red, orange, yellow, green, blue (default), indigo, violet, brown and a minimal style. The homepage is full of options. Configure unique introduction copy, display content from your blog & Twitter feed, add widgets and display featured / recent products from your store. We’ve included two custom shortcodes in Capital. A sticky note which you can use to highlight a message on your site, a sale banner to notify users when you’re running special offers and an easy way of displaying ‘mini-features’ – columns of content accented by iconography.